We had spent a month searching the internet for a boat, and it had lead us to one boat. Now our offer on her had been rejected. We had no plan B. Why are we eating Oysters? Find out soon…. Today has been a delightful day, but there is a sadness bubbling threatening to break the surface tension. We woke to another glorious day in paradise. The beach calling us. Today is about things we love: coffee, beach, massages, ice cream, more beach and some rock scrambling. Like caged animals we embraced space after the three day trip from Sabang, Indonesia to Koh Lipe, Thailand. Tomorrow we will complete our journey back to Malaysia where we begin the process of leaving the boat. Indonesia. Should we? Just pop across the Malacca Strait and add a new country to our cruising list? OK! The Sabang Marine Festival in Indonesia (advertised as a ‘yachties fun gathering’) sounded intriguing. We were attracted by many things: experiencing a ‘passage’ with kids; seeing a remote corner of the world; opportunity meet other cruisers; great snorkelling; and… free food. We arrived after three days like zombies, sleep deprived and clueless. Our passage buddies dropped anchor an hour after us and they put up a yellow flag. Officials came to their boat to check them into the country. Hmm, so we raised a yellow flag too. Minutes later and I’m resting when the shout comes from deck, ‘we’ve got company!’. I bounce up, get dressed and quickly tidy up before 7 men clamber aboard from quarantine / customs / immigration. They are all extremely polite and respectful. I show them our medications, alcohol and electronic devices on request and next they are posing for selfies on the bow, ha ha! They direct us to the medical centre to have a rapid screen malaria test and leave. At the medical test a lady hands me her card saying she is organising the Festival and to contact her if I need anything. I didn’t know at the time, how much I would appreciate her. The anchorage in Sabang, where we arrived bleary eyed in the afternoon after our three day passage. Walking around Sabang trying to find our passports (at Immigration when we finally found the building). The 6 day Sabang Marine Festival took us on a tour of the Island and ferried us to Banda Aceh on the mainland to see the recovery of the town post-tsunami. Those two days were brilliant. We also had traditional games, amazing cultural displays of dancing and music, a rowing competition and a great time making new friends at mealtimes. We were treated like celebrities, a position we felt most unworthy of. I highly recommend the Festival. Model anything is kid-interesting, model boats even better! At the museum of Sabang. Best vantage spot of the dancing on stage. Another dancing display at the tsunami museum. Seriously, how hot must they be in that get up. It was baking in the shade. One smart guy brought an umbrella at least. The baskets contained betel nut leaves which they then offered to the audience. Watching a parade from the best seat (dock) in the house (marina). Oh the people. From the minute we stepped ashore, we realised few westerners visit Sabang. Let alone bringing blue eyed kids. Everywhere people reached in to pinch cheeks, motorbikes stopped to stare or wave. It was all very good-natured but it was also extremely invasive. How can you teach children about boundaries when people ignore a child’s obvious discomfort and continue to peck at them? We all really struggled with this and at times had to push people away with a smile. That aside, the people are some of the loveliest I’ve met: I left Justin’s phone in a shop and the owner motorcycled all over Sabang to find us and return it, thank you kind stranger. It was telling the way the community treated the old man, Amein, who won Leora’s heart. Clearly he was once a pioneer of tourism in Sabang, now just desperate to share his story, he was brought along to many events and his presence added colour to our experience. The lady who handed me her card that first day, Nani, her husband Budi and daughter Zahra did a fantastic job of making the event run smoothly, and beyond that provided help when we couldn’t attend events and offered to find us a doctor when we all fell horribly ill. The night after the Festival ended we all spiked temperatures. The kids hovered around 40.c for 4 days. Intriguingly, the tropics don’t feel so hot when you are 4.c hotter yourself. If I hadn’t been so ill myself I would have been concerned for our health. During this time, we were grateful we had friends, cruisers and locals, who would help us if needed. Sadly, we lost our beach and snorkling time in Indonesia… and a week from our lives. Now we are running late returning ‘home’ and we will be rushing to deconstruct our boat life. We fly to Spain in 10 days. I thought we would be ready to leave the boat life, but we are not. We love the life, we love the friends we’ve made, we want to stay. We look through boat classified and hope our dream boat will appear so that we can continue living this life, the nomadic adventurous life afloat, that we dreamed about for 15 years. When will we be afloat again? Soon, I hope. A daddy daughter moment. It’s moments like this we do it for. On our way to pick up ‘nan’. Excited much? 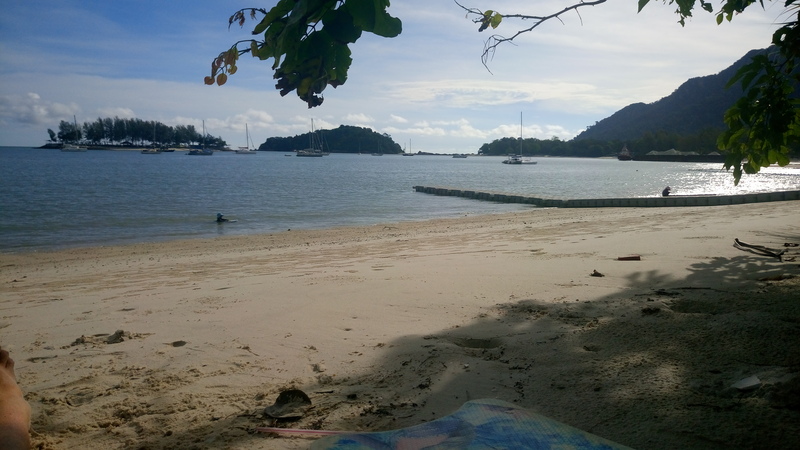 I’m sitting on Telaga beach, where we first moved onto the boat 5 months ago. I remember the elation of that day. We were so excited to start our adventure and be a family again. And I wonder, can you have too much of a good thing? Today did not go as planned, what should have been a 3h trip became 5. Torrential rain delayed our departure, then we were motoring against the tide. Next we hit a large swell, unforecasted. We were unprepared. Sea sick, no meals prepped and the boat items not secured. Another lesson learned. Right now we have a brief reprieve from the constant fighting as the kids are happy when on the beach. But I miss alone time, it doesn’t exist. I know this mood will pass but today boat life is not all roses. More posts are in the pipeline, and I promise they will be more upbeat. Til then, I hope the sun shines in your corner of this small blue ball. The sun sets across the sleepy bay scattered with yachts. From my vantage point at the beach bar, I glance at the kids playing on the waterline and realise it’s time to get back to the boat. Time to slurp the last of my mojito (moe-JYE-toe), round up beach toys and say goodbye to our new friends. It’s been a lovely afternoon chatting with another boat family while their kids and ours play. As our dingy scoots back to the boat in the fading light, cool wind in our hair, I remember it’s a Thursday. Lots of nothing has happened since I last wrote. When was that? Two weeks ago? A month? I’m losing track. But lots has happened too. On the eve of leaving Thailand, we had a change of heart and decided to extend our visa. Off we went to immigration, half a day and a $20 bribe later we had an extra month. Best decision ever! We started looking for places to go away from the manic tourism of Phuket. Day by day, we started learning about the next anchorage north. Until we ended up here: Koh Phayam just next to the Myanmar border. Koh Phayam is sleepy, like really sleepy: a few European hippies a few beach bungalows, no cars. Come check it out before one billion Chinese tourists in trip boats learn about it. Lots of nothing: naptime or train time? Are we having fun? Yes sir-ee! Without the distractions of city living I am finding time to do things I’ve not before. I made my first labneh (yogurt cheese) today. I am working on things with the kids that take time and attention, like getting them to participate in chores. We practice writing in the sand. The kids are learning to entertain themselves with very little, a skill I want my kids to learn. We stumbled upon the most magical island one day, almost deserted, so we spent an entire day hanging out on our own little piece of paradise. Our life is other people’s two week vacay to Thailand. Helping with the cooking: chickpea, potato and left over rice patties. Yes, you get creative when there are no shops nearby! A, B, C, D, E, F, Geee…..
Is it easy? No sir-ee! I had a shower tonight at the beach bar. First shower in a month. Most nights we sleep salty. Water is a premium and most of our fresh water seems to be going to laundry. Take the other morning for example. The first sound I heard in the morning was, ‘mummy, I’ve got wet pants’. There goes hours of my day washing the bed sheets. Normally MrFour is really good, but this was the third ‘accident’ in a week. Exhausting! While I washed bed sheets, the sun rising, a horrible poo smell emanated up through the hatch. Oh no. MissTwo, who only wears a night nappy couldn’t take it off to get to the toilet in time. When she eventually got it off she stood in it and walked to the loo to finish her business! Hmm, maybe we won’t embark on a 8 hour journey today, it’s ‘cleaning day’ instead! So on we go: salty and a little smelly, charting our next destination on the fly. How long will we stay in Koh Phayam? No idea!